So what is Pop Art anyway? Pop Art emerged in the 1950’s as a reaction against abstract art, and was meant to bring art back into everyday life for everyday people. It is now one of the most popular and mass produced forms of decoration and art. Pop Art deliberately incorporates images of popular culture, often of consumable goods, and tries to make art accessible by representing parts of everyday life. Pop Art artists often use recognizable images in creative ways, as you’ll see below. Andy Warhol’s “Campbell’s Soup” installation is an iconic piece. Both the form and content of the piece reflect the realities of mass production. Each can was silkscreened, which is a quick way of print making, and then Warhol individually added different soup names to show all the varieties of the brand. 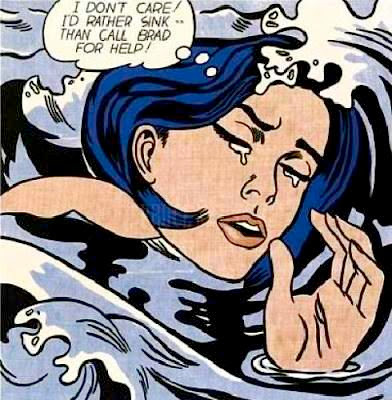 This piece “Drowning Girl” is by well-known Pop Art artist Roy Lichtenstein who was inspired by a comic book. Lichtenstein manually reproduced the Benday dots used in comic books, which became a common technique in Pop Art. And you probably know this one! Andy Warhol also made famous portraits using the Pop Art style, such as this one of Marilyn Monroe. These Pop Art styles have become increasingly popular to reproduce and customize for easy, trendy decoration. Feeling inspired? You can recreate Warhol’s style and create your own Pop Art-esque portrait very quickly and easily in CorelDRAW. Watch this tutorial on Making Pop Art posters to get started!